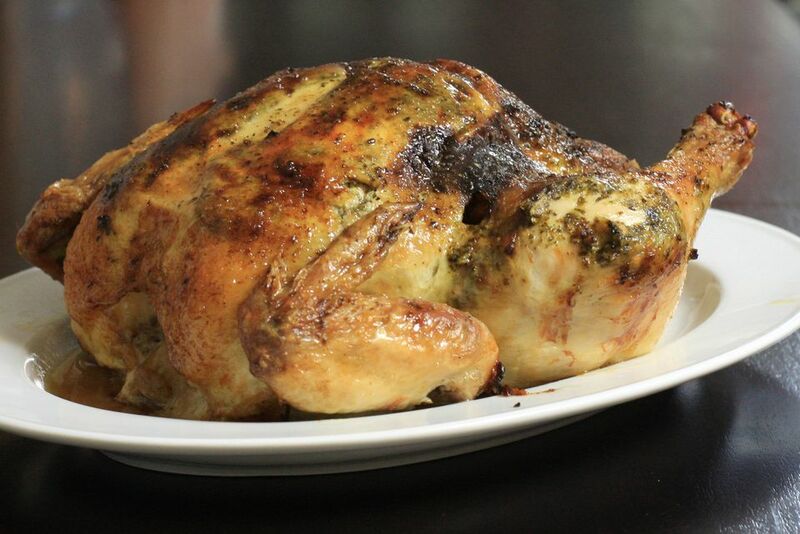 This is a quick and flavorful pesto roasted chicken to prepare for any meal. It is a simple, easy and tasty recipe. Using your fingers, separate the skin from the meat around the breast and legs. Push small amounts of pesto under the skin. Rub any remaining pesto over the skin and sprinkle lightly with salt and pepper. If desired, fill the cavity with cut-up lemon and orange, along with fresh basil leaves or about 1 teaspoon of dried basil. Roast at 425 F for 15 minutes, then reduce heat to 350 F. Continue roasting for about 18 to 20 minutes per pound, or to about 165 F on a meat thermometer inserted into the thickest meaty part of the thigh.